Diving In: Walt Disney World Pool Reviews- A kid’s eye view of the Grand Floridian. Ellie and Ava swim their way through vacation pools. After all, what is the best part of vacation when you are a kid? Hi! I am Ellie. The pool at the Grand Floridian Resort and Spa is one of my favorite pools and I would like for you to like it as much as I do, so I am going to tell you about the pool. All three of the pools at the Grand Floridian are open from about 10 am to 10pm. (The pool hours vary daily and you can check with your mom or dad for the daily schedule.) You are allowed to go night swimming which is my favorite. and every night they have an “Electric Water Pageant” on the water lagoon in front of the hotel, so you can watch that while you go swimming. It starts at around 9:15pm. The Grand Floridian buildings really close to each other so the pools are not too far away from each other. Do not worry about towels because they have towel stands (the towels are for free) and towel returns, or you could just bring you towel to your room. The three pools are great. There is one pool with fountains, one pool with a water slide and one courtyard pool. There is a also a “Mad Hatter” little kids play pool. It was cool but I was too big to play on it. My sister loved it though. The water slide pool is my favorite because the pool is nice and warm. It is a clean and round pool and has a gradual entrance. The deepest the pool gets is 4 feet deep. There is a waterfall that is slightly cold but the other water is warm. Now for the best part: the water slide! There is a big boulder and you walk up the side of the boulder and you go up a staircase and a sign that says the rules. (There is also a light that when it is green, you can go down the slide. When it is red, you need to wait your turn.) The slide does not go under any tunnels except for one little arch. There is no waterfall falling on you either when you go down the slide…I thought it was great! Disney does water slides well! Grand Floridian Water Slide. Courtesy photo. Reviewed by Ellie Simmons, age 10. December 2013. Great job, Ellie! 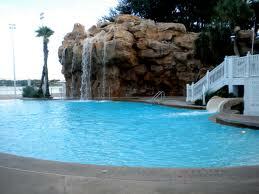 it made me want to go back to Florida and stay at the Floridian, just to go swimming at night! Thanks Miss Kathy. I loved the pool. thank you for reading my article. Thanks Bubbe!I am glad you did the waterslide.